Finding ways to calm your high-energy schnauzer will make both of you happier. Superior intelligence and endless energy can be a destructive combination in one small furry package. Sound like your schnauzer? There are many ways to channel that energy and calm him down to make life happier for both of you. All dogs no matter the breed should have basic obedience training. Check with your veterinarian for trainer recommendations. The process of learning and practicing obedience commands gives schnauzers the physical and mental stimulation they desire. Obedience commands also help you learn how to react to your schnauzer’s energy and lay the groundwork for communicating with him. 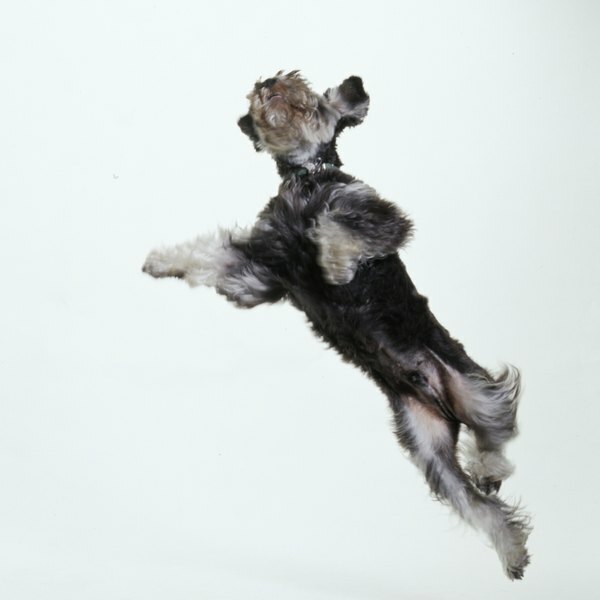 The single most important element of calming a high-energy schnauzer is physical exercise. Running around your fenced yard by himself is not enough exercise. He needs at least one and preferably two vigorous 30 to 60 minute leashed walks a day. Another outdoor option is to take him to a dog park where he can run around with some friends if he enjoys other dogs. If you don’t have a dog park nearby, arrange some doggie play dates. Many areas of the country offer agility competitions for dogs. This is great exercise for you both! The American Kennel Club offers go-to-ground contests that give miniature and standard schnauzers the opportunity to use their innate vermin hunting skills. Giants excel at cart pulling, tracking and herding contests. If you can’t get outside for a walk, there are plenty of indoor activities you can do with your schnauzer. Fetch is simple to play inside. If you have steps, it’s even better to throw toys up the steps for him to retrieve. Hide and seek, either hiding yourself or treats, can start very simply and build into a more challenging game. Schnauzers are an extremely intelligent breed, brimming with curiosity and a drive to solve problems. Mental exercises allow schnauzers to focus their intelligence in a positive way. Brainteaser type toys like treat balls are great options. The Kong™, Canine Genius™ and Nina Ottoson™ toy lines are widely available and offer a variety of problem solving toys that extend from simple to complex. You can combine basic obedience training with physical and mental exercise by having your partner or a friend stand apart from you. Using the “come” command, each of you alternate calling the dog to you and have him perform various obedience commands with treats as his reward. This game has many variations with the addition of a Frisbee, favorite toy, obstacles or additional people. If your schnauzer is spending lots of time home alone, doggie day camp may be a good option for him. Day camp, if managed properly, provides a fun environment for your schnauzer to get lots of physical and mental exercise. Be sure to ask a trusted pet professional to recommend a reputable day camp. What Are Ways to Calm a Kitten?